"We turtles do not know the meaning of the word defeat." Those are pretty tough words, and it takes are pretty fearless leader to be able to say them and mean it. Also, they need to be a turtle. We can help you with the "turtle" part with this Deluxe Leonardo costume, but it's up to you lead your brothers in the fight against the Foot Clan! As the oldest and most focused of the Teenage Mutant Ninja Turtles, Leo can seem like a bit of a stick in the mud at times. But, as the one in charge of the most fearsome fighting team in the world, he can't afford to slack off. Of course, he's not serious all of the time, and he occasionally parties it up with his brothers. For the most part though, if they aren't on a mission or training, he can be found meditating or practicing his slicing and dicing skills. Being the responsible one is tough, dude! 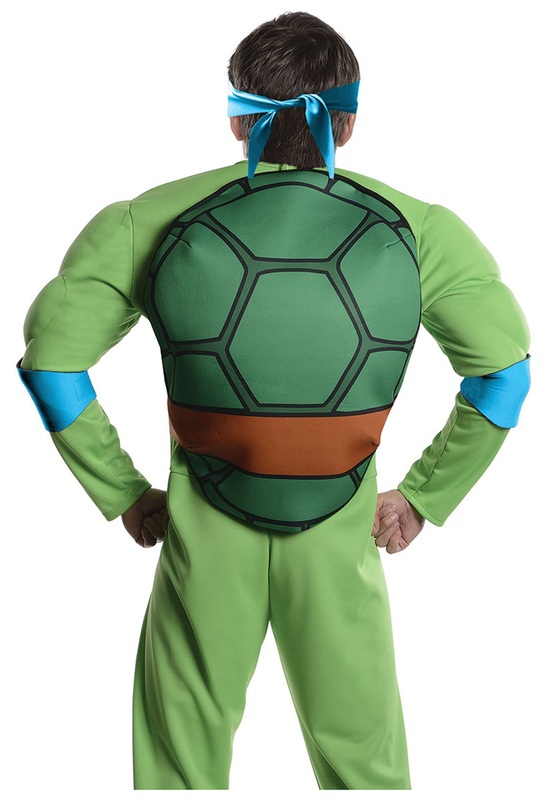 Luckily, it doesn't take a lifetime of martial arts and discipline training to look like this hero in a half shell. Simply don this one piece green jumpsuit, which has pre-stuffed muscles built into the sleeves (way faster than going to the gym) and a velcro shell that can be stuffed and attached to the back. 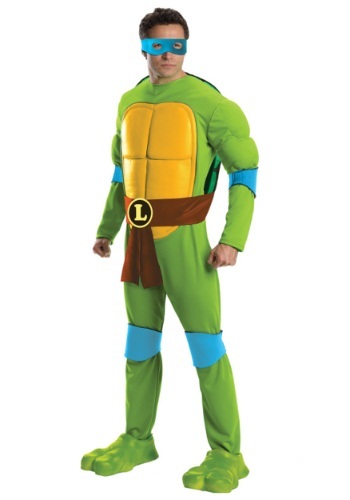 Then, just slip on the turtle foot shoe covers, and Leo's trademark blue pads and eye mask to finish this awesome costume. You should totally check out our TMNT masks and costume swords if you're looking for a radical "full turtle" experience. If you want to be the leader, you gotta look your best. Turtle Power!! !